WILLEMSTAD - King's Day ("Koningsdag" in Dutch) is a national holiday in the Kingdom of the Netherlands, which includes Curacao, on which we celebrate the birthday of our King. It is generally celebrated on April 27 (April 26 if the 27th is a Sunday). In 2014 King's Day will be celebrated in Curacao on the old date of Queen's Day (April 30) for one last time. The holiday is famous particularly for the "Vrijmarkt" ('free market'). On this day anybody is allowed to sell their goods outside in specific areas without needing a permit. 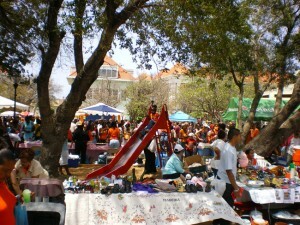 As a result many people and children will flock to the Wilhelmina Square in Punda and the Nieuwstraat in Pietermaai Smal to lay out a blanket or set up a table and display the things they want to sell, complemented with some professionals with more elaborate stands.De Vrijmarkt also includes all kinds of off-beat games, activities and performances to liven up the event. The color of the royal family is orange and on King's Day the people tend to go slightly mad with this color. They will dress up the streets in orange, wear orange clothes, eat orange pastries and drink oranjebitter (an old-fashioned orange liqueur). This is called "Oranjegekte" ('orange madness') and is generally a hilarious sight to watch. This is the evening before King's Day. Where King's Day is mostly a family event, King's Night is party time. Since the next day is an official holiday and people are gearing up for orange madness they will party well into the night the night before.